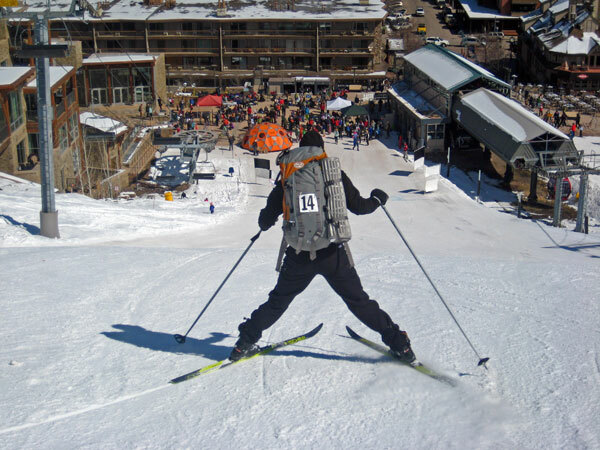 The 12th Annual Elk Mountain Grand Traverse was held this past weekend. 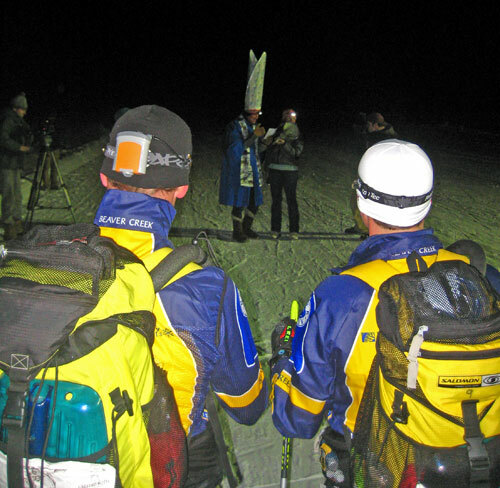 Nearly 130 teams of two lined up for the midnight start at the Crested Butte High School, ready to make the 40 mile ski pilgrimage through the night to Aspen. 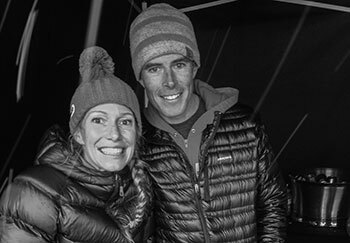 This year’s race was marked by single digit temperatures and driving winds up high which most participants took in stride, because anyone who has done this race knows– it’s never ordinary out there. It’s always something at the Traverse. 1998 – As its inaugural run there was little to compare to, though in hindsight a unique facet of the 1998 race was that an Aspen team actually won. Pierre Wille and Travis Moore crossed the finish line first, earlier than expected and before the organizers even got there. Sadly enough, to this day they are the only Aspen team to ever have won this classic. 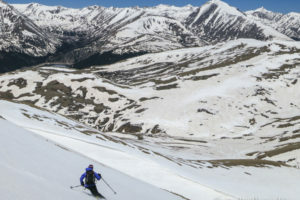 1999 – Big snow before the race and subsequent increased avalanche risk resulted in a reroute of the course, starting and finishing in Crested Butte, historically referred to as the “Grand Reverse.” This was my first year. 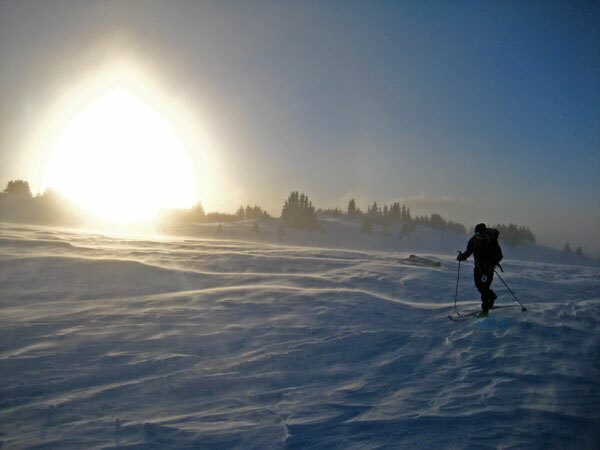 2000 – Nice weather, the challenge this year came in the form of a struggling partner. Do this race enough and you too can experience what it feels like to be the struggling partner. It’s not fun. 2001 – My best year, coming in in 9:35 with George Desort. Swix Extra Blue worked the whole way. I should have retired at the end of this one. 2002 – Lean spring snowfall resulted in “slide for life” conditions off Star Pass where Ted MacBlane and I did just that, plummeting a few hundred vertical feet down the side of the mountain when the wimpy plastic edges on our XC skis failed to hold. I swore the race off after this year. I vaguely recall Andre Wille breaking one of his with 19 miles to go yet we still weren’t able to take him. Damn those long legs! 2003 – Bitter cold with loads of racers dropping out at the Friends’ Hut. Some of those who bravely pushed onward got some frostbite in addition to their finishers medal. Thankfully, I was away for this race but Christy and May Selby were there as partners. May’s frostbitten big toe forever serves as a reminder why 2003 would be her last year here. 2004 – The spring weather was so warm, huge stretches of Brush Creek were melted out leaving lengths of dirt trail to cover on foot. All three major snow bridges were out and the creek crossings were made barefoot. Brrr. Thankfully, I was injured and missed this year as well. 2005 – Going out too fast as usual, I bonked badly and never really recovered. Sorry once again to my partner, Ted MacBlane. 2006 – A virtual repeat of 2005 for me. When will I learn? On good terms my four year partnership with Ted MacBlane ended here. 2007 – This is the first year Christy and I would race together. Brutal winds and resulting ground blizzard on Taylor Pass caused many to retreat to a support tent for safety. A couple dozen teams dropped out as a result including some of the leading women, earning us 1st place in the coed class and getting Christy the honor of 1st woman to finish. 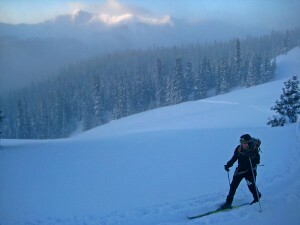 2009 was another cold one with high winds at both Star and Taylor passes which contributed to the near 35 DNF’s. True to form, Christy had her down mittens on all the way to Barnard Hut. And in the style of a couple of rookies, the single digit temps froze our water in the tubes right in the beginning and we never really got it straightened out. Afterwards, at the finish, Christy noted her Camelbak was pretty close to full, carrying it by her chest to thaw but ultimately staying frozen all night and drinking next to none of it. She carried the near five pounds of water all the way home. Ground blizzard conditions up high sandblasted exposed skin leaving some with frost nipped noses and cheeks. Christy’s natural gag reflex for GU had her spitting it back up repeatedly. The rest of our “real food” was all frozen up. There was some good in it though. More than two feet of snow had fallen in the days before the race which made the stretch between the passes really cool. Even though sunrise is usually the coldest time of the race, we had about an hour and a half where we didn’t see another team and we just plodded along the track, all bundled up. 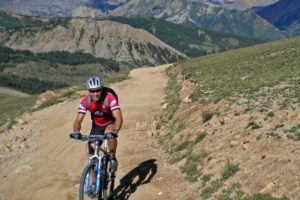 Thanks to the leaders for getting the trail right this time. (click any photo to enlarge) The new snow also helped make the descents on the wimpy skis a bit less harrowing. At least the crashes don’t hurt as much. Around six in the morning, when you’re dropping into the steep bowl on the other side of Star Pass, in full darkness and on edgeless XC skis, that helps. I think that if there’s one consistent thing year after year, it’s the feeling just before descending into the dark abyss, with only a faint glimmer of a headlamp or two down below showing the way home. That moment is a thrill every year. And what of this photo? Well, our place at the start line, while listening to the final prayer before our send off, was from right behind last years victors, Mike Kloser and Jay Henry. And who were we kidding, lining up immediately behind Mike, the soon-to-be five time winner and course record holder? Well, in our defense we were told this year they would begin the race with a rolling start, a more civilized slower option to the usual sprint where the ensuing carnage often leaves in its wake a scattering of trampled skiers and broken poles. So we figured since it would be a slower pace off the line, we could start further up towards the front. We just kind of found ourselves there. As the prayer concluded and mere seconds before the gun went off, the announcement was made that the rolling start wouldn’t actually happen and it would be the standard free-for-all, and good luck to everyone with that. Yikes. It was too late. We were locked in our place up at the front and had our skins on. When the gun went off we were instantly consumed by the pack of sprinting skaters, and then spit out the back. In hindsight it was pretty funny. Sorry to anyone who found us in their way. And soon enough it was over. That works for us. Two minutes later we were rehydrating with a couple of beers. And if we get our tenth finish next year we agreed to take a year off. We’ll see. Ted, you sure captured the feeling of this year’s race – I only wish I was at the top of Star Pass in total darkness at 6am… Congrats to you two!! Love how you summarized the history of the Traverse and the photo perspectives are really cool. Great recap! And congrats on a great race. Thanks guys. It’s always a good one to get behind you. May, maybe a return for 2010? thanks for the recap; I will direct Dirk to this post each time he asks whether we should be doing this race! congrats again to you, Christy and all the finishers! Off the couch and hungover is the only way you two should be allowed in. Impressive report Teddy. You are developing nicely into one of those peculiarities of the Internet age — a blogger who can actually write! I second Tim M’s comments!! Love to you & Christy. Top 20 and you had time to take pictures. Nice work. I was too sacred hanging on to Pat’s wheel to consider photography! See you two at the line next year. Next year we may be a few rows back, that is unless the rolling start actually takes place.